A marriage between Umberto and Marie José was indeed in the cards, but the press and the public had to wait six more years before it was made official. The engagement was announced between the twenty-seven-year-old Italian crown prince and the twenty-three-year-old Belgian princess in Brussels on October 24, 1929 -- a day better remembered as "Black Tuesday," the date of the stock market crash that triggered the Great Depression. Umberto and Marie José's week wasn't much better. Umberto had decided to lay a wreath at the Tomb of the Unknown Soldier in Brussels as his first official act following the engagement. As a band played the Italian national anthem, a student fired a revolver in Umberto's direction from fairly close range. He missed, and Umberto calmly went about his wreath-laying business. 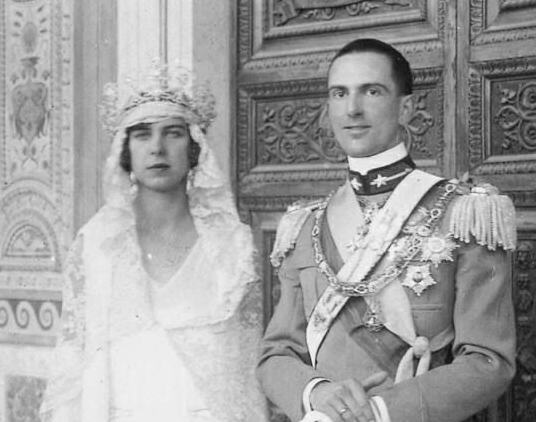 The wedding date was fixed for January 8, 1930; Umberto had specifically requested the day, which was the 57th birthday of his mother, Queen Elena. Following the assassination attempt, extra security was employed for the Belgian royal family's journey to Rome. Extra guards were hired to patrol bridges and crossings along the royal train's route, which was reportedly kept secret. On January 5, Princess Marie José arrived in Italy, accompanied by her parents, King Albert I and Queen Elisabeth, her elder brother and sister-in-law, the Duke and Duchess of Brabant, and her second brother, Prince Charles. Marie José's parents gave her an early nineteenth-century parure of diamond and turquoise jewels, including a necklace, a pair of bracelets, a large brooch, and earrings. She wore the turquoises, with the necklace "mounted as a bandeau in the fashion of the period," at a reception at the palace in Rome held two days before the wedding . She was also given a diamond and ruby ring by Tammaro de Marinis, a Neopolitan book collector . According to the Times, the nation of Belgium gifted their princess with "a Brussels lace marriage veil and a diamond ring." On the day before the wedding, the royals gathered on the balcony of the Quirinal Palace to watch a procession of Italians from all over the country in traditional local folk dress. The people performed songs and did traditional dances; many of them also brought gifts to the couple. Newspapers estimated that 300,000 people participated in the parade. The same afternoon, the Belgian royal family had a private audience with Pope Pius XI before returning to the palace for another glittering reception. At that evening reception, Marie José wore Queen Margherita's pearls with a pink gown. Newspapers commented on the purple gown worn by Queen Amelie of Portugal, who also donned a diamond tiara -- perhaps this one? On the morning of January 8, the royal guests gathered in the three-centuries-old Pauline Chapel at Quirinal Palace for the wedding. The groom's sister, Princess Yolanda, had married Count Carlo Calvi di Bergolo in the same chapel seven years earlier. Marie José wore white for her wedding -- more precisely, a gown with an ermine train that had been designed in part by Umberto himself -- topped with a lace veil and the famous diamond and pearl Musy tiara that had belonged to Queen Margherita. Like her daughter, Queen Elisabeth dressed all in white, with a lace veil and "a magnificent diadem of diamonds." Queen Elena wore mauve and also donned a veil and a diamond tiara , along with her triple-stranded pearl necklace. The New York Times described the chapel as "pervaded by a subtle odor of incense and glowing with the colors of flashing jewels." During the wedding ceremony portion of the mass, four princes from the House of Savoy held a veil over the heads of the couple, a tradition performed at the weddings of the first-born sons of the family. 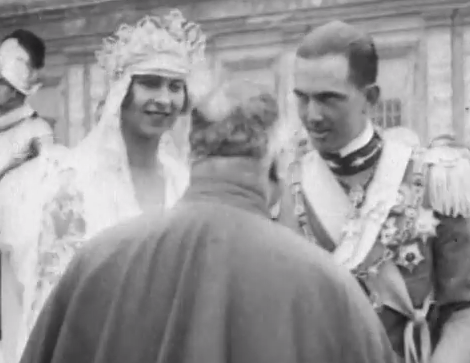 The Archbishop of Pisa, Cardinal Pietro Maffi, presided over Umberto and Marie José's wedding, but immediately after the ceremony and a quick balcony appearance, the newlyweds hurried to the Vatican for an audience with Pope Pius XI. Marie José didn't have time to change her dress. Press reports note that she apologized for appearing before the pontiff in the gown -- perhaps because she did not have the right to exercise the privilege du blanc? 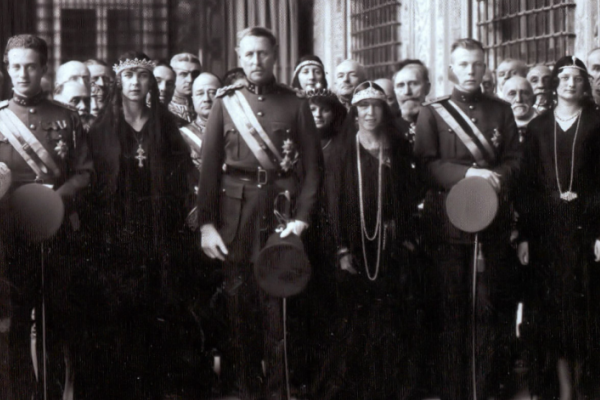 Either way, Pius XI was apparently gracious about the sartorial situation and offered the new crown princess a gem-studded rosary as a wedding gift. Newsreel footage of the departure from the Vatican shows Queen Elisabeth and Princess Astrid dressed in black and wearing tiaras. Marie José's wedding was one of the only times Princess Astrid is known to have worn one of her wedding gifts, the Stockholm Tiara, as a diadem. After the private audience, the couple hopped in a car to head to the wedding breakfast, and then drove to lay a wreath at the Tomb of the Unknown Soldier -- this time, with no assassination attempts involved -- before returning to the palace. The official wedding celebrations continued for another three days. Umberto and Marie José did eventually become Italy's king and queen -- but only for thirty-four days in the spring of 1946. After the monarchy in Italy was abolished, the couple separated, but never divorced. They had four children, including Vittorio Emanuele, the current pretender to the Italian throne. 1. The turquoises were sold in the auction of Marie José's jewels at Christie's in 2007. 2. The ring was sold at Sotheby's in November 2015. 3. Elena wore this tiara, which has been in a bank vault in Italy since the exile of the royal family in 1946.